I wanted to let you know that I added a new blog to my blogroll today. That’s usually not postable news, because most of the blogs I follow are general interest for women like us. They are from a Christian perspective on varying topics that you or I might find useful and intetesting. I first met Emily’s extended family at the small church we attended where my husband and I met. We had been involved with some of the youth events and had the opportunity to get to know her uncles who were still in high school, twin boys who were deeply committed believers, and were like everyone’s big brothers. They had a genuine care for all around them and my daughters in particular adored them. Not long after they graduated and moved away, I had the opportunity to meet their parents. It was obvious that their faith had been instilled in their sons along with a deep family bond. I understood that they also had an older daughter who was married, but who lived in another town and had young children. After several years, I finally met the daughter and her daughter by chance at the little fruit stand where I worked. Let me just say that I loved Kristen and Emily immediately! Partly because they were an extension of the people I already knew and loved, and partly because they themselves are inspiring people. I was doing the baking and cooking for this little fruit stand, and for a short time I was able to have Emily as an apprentice of sorts in the kitchen with me. For reasons beyond my control, it was as I recall a VERY short time. But in that time, I think I learned a lot more from Emily than she ever learned from me. Did I mention she was only about 12 at the time? Emily’s passion for cooking amazed me. She loved to be in the kitchen and had been making trips across the state for cooking classes. She loved to share recipes ~ I still have the recipe for her grandma’s golden syrup cookies. Yum!! But the thing I remember most about our time together is just how grateful she was for any opportunity to participate and how sweet and kind and insightful she was. What a joy she was to me! So it was with a heavy heart that I had to tell her mom that the owner of the fruit stand wasn’t going to let her come anymore. It wasn’t anything that had happened, I think just the owner’s own fears about building a growing business. But it was heart-wrenching for me. I eventually left that job over similar arbitrary decisions made by the owner, but that’s a different story. My next opportunity to work with Emily came a short time later as Kristen asked me to help put on her husband’s birthday party. What a fun day that was! Emily was clearly the master mind in the kitchen and it was a privilege to be a part of the festivities and create a wonderful atmosphere for a great party. I don’t remember all the particulars (but Emily says she has a great memory so I’m sure she’ll remind me ~ maybe in a guest post here someday?) but I remember how I felt at the end of the day. We had worked long and hard together, preparing the food and the atmosphere. Of course, I had been hired to do a job, and I remember I was paid well, but I remember thinking it was too much for what I had actually done. And the gratitude of both Emily and her mother was so heartfelt and…well, profuse. I remember thinking I’d never met such grateful people. By the end of that summer and through a whirlwind series of events my husband and I had moved across state for his job opportunity and I haven’t seen Emily for a few years. But through the wonder of social media I came back into contact with her grandmother and mother, and more recently with her to wish her happy birthday. What a sweet thing to realize what an amazing godly young woman she’s become. Smart, beautiful, a talented chef and writer, and so in love with Jesus. I flew into San Diego on a Sunday so I missed church that day. One week into my 3-week stay we headed to my daughter and son-in-law’s church, a small church startup that promotes family participation. The congregation of about 40 people, meeting in the all-purpose room of a local elementary school, ranged in age from infants, my grandson among them, to grey-haired grandparents, which of course does not include me! It was not their typical Sunday as the pastor and his wife were traveling to visit relatives. Apparently the pastor’s wife normally leads the worship band and they mentioned more than once that they felt ill-prepared in her absence. In reality they were well-enough prepared musically, it was their confidence that needed some bolstering. The worship set was well-laid out and their execution was beautiful, even without a drum set. But it was the heartfelt encouragement they received from an unlikely congregant that transformed their offering into a truly joyful noise. I thought my heart would burst right out of my chest just then, as that sweet little encourager lead that congregation in the purest moment of worship we would share that morning. And it started me thinking anew about ways to encourage those around me. I have to admit, my voice is not always like that of the young girl, applauding and praising other’s efforts. Even as I type those words I cringe a little. I could say “Well, my spiritual gifts lean more towards equipping than encouraging.” And that would be true… Equipping, by its very nature, is more practical than reassuring, more clinical than compassionate. But I don’t think that lets me off the hook to develop my ability in this area. One of the first definitions I found for ‘encourage’ said ‘to stimulate spiritually.’ I could end my post here and feel quite satisfied about having made a point. Except that as I looked into the Greek word for stimulate I found an interesting tidbit. The Greek word, paroxusmos, evolved into our English word paroxysm. Commonly used as a negative connotation in our language these days, it means ‘an uncontrollable outburst’ and is often associated with anger. However, it can also carry positive connotations. The dictionary provided this explanation: a paroxysm of giggling. Well, of course! My dear friend and ministry partner often sit in her office discussing options for ministry. I already knew that our sometimes uncontrollable outbursts of giggling really do spur us on in ministry! But seriously, as I looked at these definitions and considered its meaning in the Greek (to stir up, provoke, goad ~ in a positive sense to rouse one to action or emotion) I realized that indeed I have a responsibility to encourage those around me. The word forsaking here is the same word Jesus used on the cross when He cried out “My God, My God, why have you forsaken me?” In the Greek it means to utterly abandon or desert. As we head into summer I think of some of my church family that I will likely not see again until Fall programs kick-off. One of my greatest heartaches in ministry is to see churches that shut down any formal Bible study or gathering over the summer. Not to get on my soap box, but ‘summer vacation’ did not begin this way. Summer break allowed students time to help with the growing and harvesting seasons on their family farms. Now however, when such measures are no longer necessary, we have made summer break the reason to check out of our normal routines. My motto lately has become ‘God doesn’t take the summer off and neither should I.’ This doesn’t mean I don’t take time to get away on occasion. Truthfully, I am enjoying a little down time from my very full ministry schedule. However, I don’t make it a habit to utterly abandon these responsibilities. I often think that if we would observe a more consistent ‘sabbath rest’ we wouldn’t need extended periods of vacation. But that is a post for another day! In any event, I am excited that our church has some exciting plans for gathering this summer, not the least of which is some solid teaching by a well-know apologetist and some great summer study/book club opportunities. Wherever you’re at I encourage you to find a place to get into the word this summer! It seems redundant until I realize that the word ‘encouraging’ comes from the word ‘parakaleo’ which is the root of the word sometimes used to describe the Holy Spirit ~ Paraklete. Literally, the word means ‘called alongside’ and reminds me that our encouragement of one another is part of our high calling as believers. It is not merely something we do for one another, it is part of who we are to each other. What is interesting here is that often we think of encouraging as comforting, especially where we see the Holy Spirit called The Comforter. But the word also has connotations, especially in this instance, of admonishment and exhortation. These words are most often used in terms of warning or calling upon toward action, not necessarily drawing the person being encouraged into a place of comfort, but of obedience. I am fortunate to have (and hopefully provide) this kind of sister-in Christ relationship with a few good friends. In our culture today though I find that this intention needs to be declared outright. It is too easy to let our behavior be governed by socially acceptable practices than by the Word of God unless we allow each other to speak into our lives. Some of the greatest encouragement I’ve received has come in the form of a sister speaking up when she could as easily have let me wallow in my bad behavior. Sweet friends, hear me when I say ~ Go find you some friends like that. You will not be sorry! p.s. If you are looking to spend more time in the word this summer try making a list of all the ‘one another’ statements in the New Testament and ask God to show you which one(s) He would have you work on! “As for me and my house, we will serve the Lord” This verse was extremely important to my husband and I as we prepared for our wedding 16 years ago. About to marry a single mom with two daughters my husband was getting a ready-made family. That, and the fact that I was a new believer at the time, made us very aware that Christ must be the center of our home. We had a small plaque with this verse displayed prominently where visitors entered our home. Over the years we acquired other such declarations of our devotion to Christ. One my favorites is a red sign with white lettering that simply reads “Rejoice in the Lord Always.” I have two favorite necklaces ~ a set of three crosses on black cords and a recent purchase – a keyhole bearing the word faith with a key dangling beside it. Not only are these symbols declarations of our faith in Christ, they are also ways that we can identify with other believers who cross our paths. One of the most common symbols of Christianity is the ichthys (Greek for ‘fish’) symbol, most prominently seen in our culture on the rear end of vehicles. I’ve always thought these little plastic car ornaments were a bit tacky and never really desired to own an ichthys of any kind…until recently when I discovered the symbol’s true meaning. The letters of the word ‘ichthys’ or ‘ichthus’ in the Greek became an acrostic: Ieous CHristos, Theos HUios, Soter. Translated: Jesus Christ, God’s Son, Savior. Wow! If that isn’t a decalaration of one’s belief I don’t know what is. This acrostic was developed and used by early Christians who were under the threat of perscution for speaking out about their faith. The symbol was used on the grave markers of those martyred for their faith. For a broader explanation see the article here. Shortly after reading about the history of ‘ichthys’ I was presented with the opportunity to review a beautiful product, the Wood Carved Ichthys Wall Hanging available from Dayspring. I now proudly display my ‘ichthys’ alongside my other declarations of faith in my home! When I first opened my package from Dayspring I was a little disappointed that the mango wood seemed so dark. I was hoping for a brighter look in my living room. 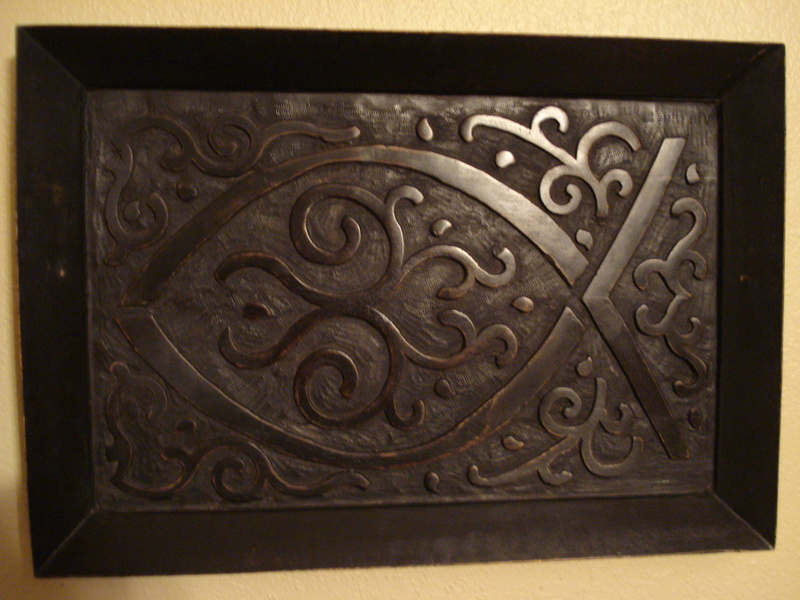 But as you can see by the picture, once illuminated the wood makes for a striking presentation of the symbol. This sturdy piece hangs well with two brass picture nails, and I think it contrasts well with my light mustard walls. I have to admit I love the scroll detail inside and around the fish. So classic and unlike its bumper counterpart made of plastic…oh so not tacky. I absolutely recommend this piece as a lovely addition to your home., as a stand-alone piece or grouped with other wall hangings. It also makes for a great conversation piece. My mom, who became a brand-new believer at the age of 70 last fall, noticed it right away. “That’s beautiful. What does it mean?” I had my newfound knowledge ready for such a question. My mom seemed duly impressed, and I think she wants one now too! As an added bonus today, I am able to offer a $20 one-time use coupon code for Dayspring to one lucky reader. If you would like a chance to win this coupon, go to Dayspring and leave me a link below with a comment for the product or symbol you would consider using your code for. Winner will be drawn on Pentecost Sunday (June 12) using random.org The coupon code expires on August 31, 2011 and shipping charges will apply to the winner’s order. I have a confession to make. It’s been a long time since I posted an entry on this blog and my confession is that I’ve been dragging my heels a bit. Ok, a bunch! You see after I got this blog up and running I began to have doubts. Doubts that I could do what I think God wants me to do with this. Doubts that I could reach many, or any for that matter, with what I have to say. And fear that what I’m doing here might not measure up to God’s standards. When we look at the two principles of these verses together we see that when we interact with Scripture such that we are transformed by the teaching, reproof, correction and training it provides, we are then adequate and equipped to walk in the good works that God has prepared for us. A favorite store in the county we used to live in bore the sign ‘Western Outfitters.’ They had every conceivable accessory for the modern cowboy or girl: boots, jeans, work shirts, rodeo garb, tack, saddles. You name it, they had it. They carried every possible accoutrement that could make a person completely qualified in the horse business, whether they were a rancher, a rider on the rodeo circuit, a horseman of any kind. Of course, we went only to be outfitted to watch the rodeo. The apostle Paul was telling his protégé Timothy that God’s word completely outfits the believer for every good work that God Himself calls us to. Not only that, but when we have applied ourselves to Scripture, conforming our lives to the text, we are completely qualified to carry out that work in confidence. It isn’t that I haven’t been in the word, it’s that I was forgetting that anything I had to say was from the word itself. Why would I doubt that what I had to say through the word could reach anyone? O, me of little faith! A few days after our study of this text, I read in David Platt’s book Radical Together, the example of a guest speaker at a gathering Platt was attending. The speaker started out by apologizing that he had forgotten his Bible and declared that through a process of prayer he felt that God must not have had anything to say to them that night. The speaker prayed and sat down. Platt rightly appraised that this speaker’s apparent neglect of God’s word had influenced his presentation and went on to say that God through His word always has something to say. Leave it to God to give me a double whammy! The day after reading this example, a dear friend and accountability partner left me a message in Facebook calling me out for neglecting my ministry on the blog – and she’s not even studying 2 Timothy or reading Platt’s book yet, I might add! Luckily God had already been prompting me, so that I was able to see her message for what it was, a gentle reminder that God has work for me to do. Ok, it felt more like a kick in the bottom, which is precisely what I needed! How about you dear sister? Is there something that you know God wants you to do, but you are at a loss as to how to do it, or having doubts that you can accomplish it? Get into His Word! Let it teach you, reprove you, correct you and train you in His righteousness that you will be completely qualified and perfectly outfitted to do His will. Grace and peace be multiplied to you in the knowledge of God and of Jesus our Lord; seeing that His divine power has granted to us everything pertaining to life and godliness through the true knowledge of Him who called us by His own glory and excellence. knowledge of our Lord Jesus Christ.